Yesterday I worked the second of my two volunteer shifts as a member of the Prospect Park CSA. I get the sense that not everyone is a fan of this membership requirement, but I find it to be great fun. While the good folk at Windflower Farm do all the work, I get all the glory. 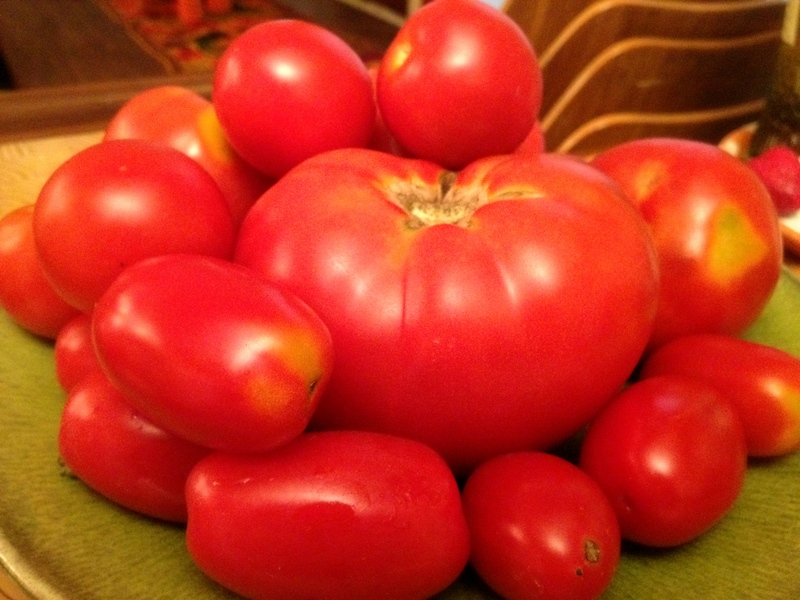 This week was particularly glorious, as tomato season is upon us. My 16-year-old sister is staying with me for a couple of weeks while she attends a Shakespeare camp. She’s coming up on her first anniversary as a vegan so I’m cooking a bit differently than usual. Tonight we managed to polish off six plum tomatoes, one medium-sized tomato and four ping pongs (cutest tomato name ever). Turn broiler to high and place a large cast iron skillet with one tablespoon olive oil in oven. Line a roasting pan or a baking sheet that has sides with foil and drizzle one tablespoon oil across it. Slice tomatoes and onion approximately 1/4″ thick and spread on baking sheet in a single layer. Drizzle another tablespoon of olive oil over the top, add salt and fresh-ground black pepper and place on the top shelf directly under the broiler. While this is cooking, cut the kernels off of the corn. (If your corn is as sweet and fresh as mine, go ahead and munch on some while you wait.) Check on your roasting veggies and, if your oven is a little uneven, rotate the pan. When the tomatoes begin to dry out and the onions turn brown at the edges, pull them out. Turn off the broiler and set your oven as high as it will go. Remove the cast iron skillet and tilt to spread the oil. Stretch dough into a disc roughly the size of the skillet by rotating your hands along the edges and allowing gravity to pull it down. If the dough sizzles when you place it in the pan, great. Place your pizza on the bottom rack of the oven and bake until the crust just starts to brown. Sprinkle with chopped basil and, if you are so inclined, a bit of good quality olive oil. We ate this with a simple salad of red leaf lettuce and tomatoes dressed with red wine vinegar, good olive oil, Dijon mustard and black pepper. 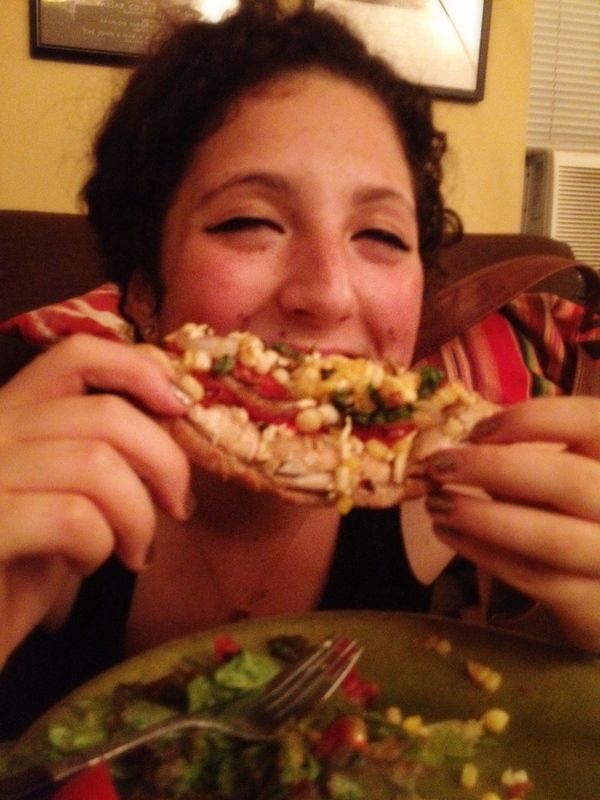 This is what a happy vegan looks like. 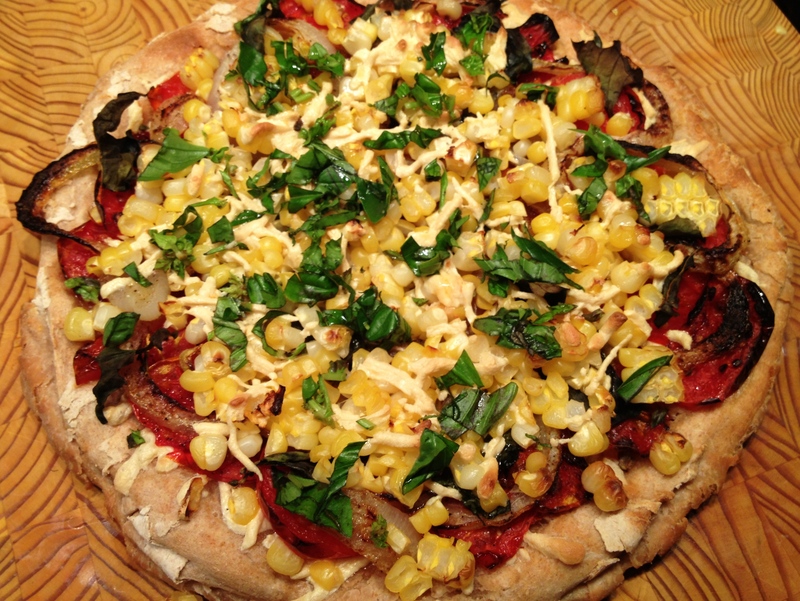 This entry was posted in main courses, vegan, vegetarian and tagged basil, corn, pizza, tomatoes by Jasmine Nielsen. Bookmark the permalink.